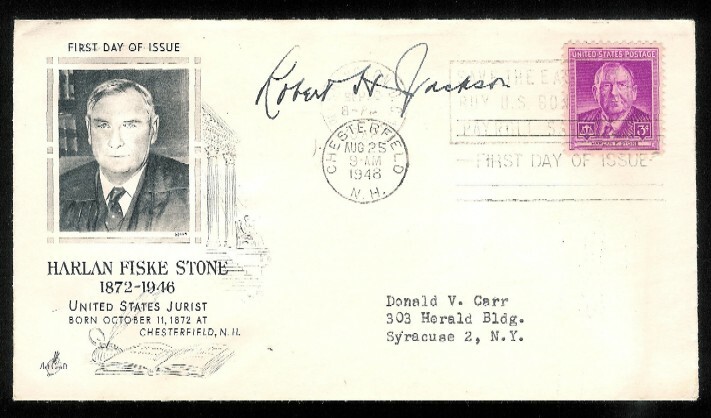 Supreme Court Justice Robert H. Jackson signed this 1948 first day postal cover honoring the Supreme Court Justice that Jackson replaced on the court, Justice Harlan Fiske Stone. Justice Jackson was appointed to the court by President Franklin D. Roosevelt after serving Roosevelt in various legal roles starting in 1934 and concluding with the post of Solicitor General. Justice Jackson is widely credited with being one of the best Supreme Court justices and is widely quoted today, even in Supreme Court confirmation hearings (Justices Roberts and Alito being the most recent). My personal favorite is the statement from his dissent in Terminiello v. City of Chicago, 337 U.S. 1 (1949) that, "There is danger that, if the court does not temper its doctrinaire logic with a little practical wisdom, it will convert the constitutional Bill of Rights into a suicide pact." For more on Jackson see Wikipedia here or the Jackson Center web site.